← Back to category "Electric graphite and graphite products"
0.69 EUR order from 2000 kg. Graphite for electric erosion from Kaya Karbon Grafit San. Ve Tic. Ltd. Sti. Kaya Karbon Grafit San. Ve Tic. Ltd. Sti. 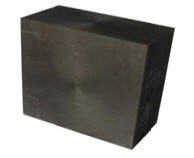 Graphite for production of electrocoal products. Rominco Polska, Sp. z o.o.